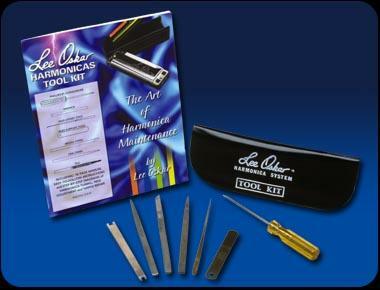 The Lee Oskar Tool Kit contains all of the tools required for maintaining your Lee Oskar diatonic harmonicas. Kit includes screwdriver, wrench, reed offset tool, reed support, chisels, and file. The instruction manual is very clear and informative. Repairing or tuning harmonicas is a skill and takes time to perfect. We advise that you always practice on harmonicas that you are prepared to throw away first before getting stuck into your favourites. However, once you can do it you will save money in the long run. Great piece of kit or harmonica gift to buy. Don't forget we sell the Lee Oscar Diatonic blues harps too.